Current Activity: Falkurneeze working on animating Sakka. who dropped out of the project. If you have any questions, you can contact us at techsupport@wyrmkeep.com. Here is how work on Inherit the Earth: Sand and Shadows is proceeding! I am splitting the game into three chapters. Chapter one will be 90% implemented before the next funding drive, and that funding drive's base goal will just be the amount needed to pay for the work on chapter one. Funding for chapter two and three will be "stretch goals" for that drive. The base goal will surely be below $30,000, even less with support from patrons. That is an amount that should easily be reachable. And by "implemented" I mean art, story, sound effects, music and voice-overs, plus a demo! Because chapter one is being partially self-funded, it is not possible to say when the next Kickstarter will happen. Work on the game will occur when myself and the artists have spare time. Slow, but steady, will have to win the race here. Inherit the Earth™ is a point-and-click adventure game and webcomic series set on a future Earth where humans have mysteriously disappeared and the dominate inhabitants are tribes of anthropomorphic animals or Morph, as they call themselves. The primary hero of Inherit the Earth is Rif, a young Fox, who is a quick-witted, puzzle solver. Such skills come in handy as Rif tends to be thrust into dangerous missions involving righting wrongs and saving his friends. The project being funded is Inherit the Earth: Sand and Shadows, a video game sequel to the original Inherit the Earth: Quest for the Orb. Release platforms include Windows, Mac and others to be determined (see Stretch Goals below). What's an Adventure Game? An adventure game is best described as a story-based puzzle-solving entertainment experience. The game’s protagonist attempts to complete a series of goals by having conversations with characters encountered in different locations and using the clues learned to resolve problems blocking the path to success. In many situations this involves collecting items to trade or use. What about Inherit the Earth: Quest for the Orb? In first game Rif the Fox is accused of stealing an ancient human relic, but is able to convince the authorities that he has the skills to find the actual thief of the Orb of Storms. Two guards are assigned to accompany Rif on his quest to ensure it is completed. There is the added incentive of rescuing his friend Rhene who is being held hostage by the Boar Tribe. Rif is eventually able to prove his innocence, but at the apparent loss of the Orb. 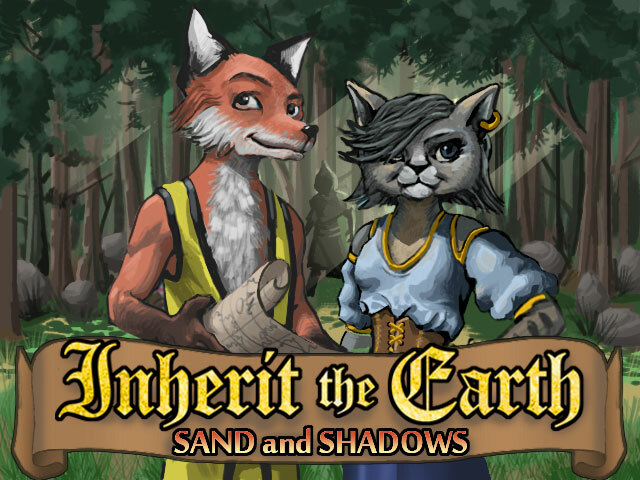 Inherit the Earth: Sand and Shadows takes place after both the original game and the webcomic story Little Wolf Lost. The Morph Tribes of the Known Lands continue their efforts to live with the loss of the Orb, which they used to predict the weather. There are rumors of the artifact’s survival, but none are credible. Even Rif, who feels some regret in being unable to retrieve the Orb, discounts these rumors. The arrival of a chieftess’ daughter, with a startling revelation, leads to Rif embarking on a new adventure to learn the truth – assuming he can avoid the doubts of friends, threats of foes, and the ravages of a great drought. Inherit the Earth is a trademark (game) and registered trademark (comic strip) of The Wyrmkeep Entertainment Co.
©2013,2014 The Wyrmkeep Entertainment Co. All rights reserved.